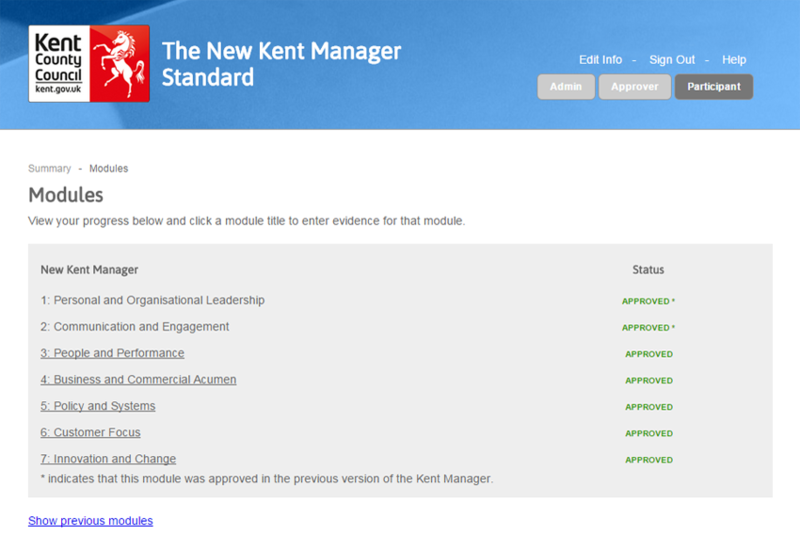 The aim of this project was to bring Kent County Council’s paper based management standard “The Kent Manager” online. The Kent Manager is a management standard for Kent County Council with internationally recognised accreditation from Edexcel. It requires participating managers to develop and demonstrate evidence of knowledge, skills, attitude and behaviour against a specified set of criteria. We started by reviewing the paper based document that was currently being used. We discussed with KCC what needs and expectations they had and also the functionality that they expected and required for the project. After these initial discussions we produced some black and white wire-frames (images showing the layout and navigation of many of the key pages). We presented these to KCC for discussion. Once the wire-frames were signed off, we produced a working demo of the site adding colour and basic functionality to the system. Again this was presented to all the key stakeholders for discussion and testing. From here we were able to continue backend development and deliver the system. Throughout the process we liaised closely with the Learning and Development team at Kent County Council and the IT department to ensure that the system not only met but exceeded their expectations. The Kent Manager provides training managers with the facility to upload, record and store evidence that they’ve met specific criteria. It allows their line manager to view and approve this evidence as their staff move towards completing the management standard. The system also has an Administrator access level, which allows relevant users to generate login and progress reports, reset passwords and also alter criteria. The system negates the need for paper and folders and is an innovative and convenient way of recording progress and storing evidence. I am extremely pleased I discovered Logicom; their work is amazing… well priced and of the best quality, with an innovative, fresh approach – throughout the project they worked with us, not for us and we were made to feel like a very valued customer. I have recommended to several colleagues.